Preheat your oven to 425. In a pizza pan or baking sheet, flatten pizza dough & spread out. Bake pizza crust in preheated oven for 5-7 minutes. Remove partially cooked dough from oven. Spread softened brie on dough of dot the dough with brie (whichever is easier). 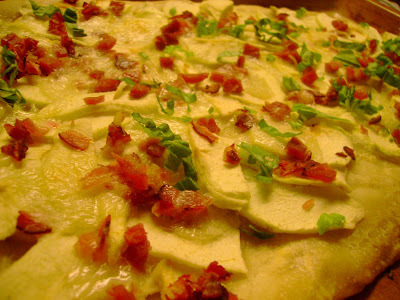 Place a layer of apple slices over the brie layer. Sprinkle the prosciutto over the apples. Top the pizza with havarti cheese. Place pizza back in the preheated oven and bake until golden brown and cheese has melted. Serve hot and garnish with fresh basil. I love Brie! I've never had it on a pizza, but I can just imagine how decadent that would be. what a great flavor combination! Yum. I had pizza from the shop around the corner last night and now I'm regretting it, as I wish I could be eating this one!